Hot Cakes - Get 'em while they're hot - lovely! * STOP PRESS * Mower Magic is Winner of the Online Retailer of the Year 2012, as presented at the industry Pro Awards, September 2012. So why buy from Mower Magic? Mower Magic is a family run business, where customer care is the main priority. We can give our customers the whole package, from the moment you think you like the look of a product, right through to the after sales service. 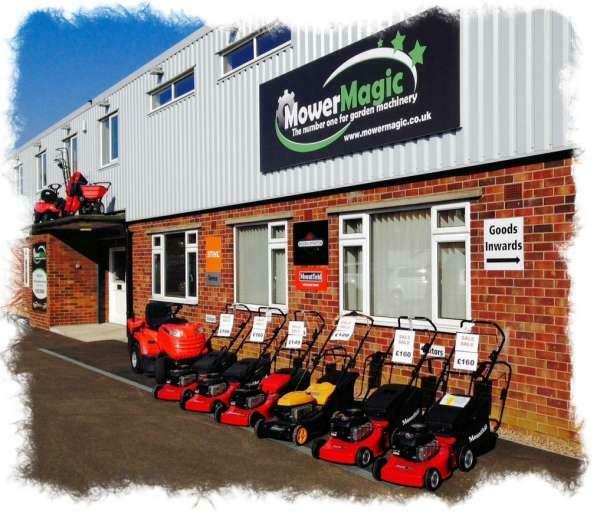 Mower Magic deals in a huge range of domestic and professional products, having access to over 25 million pounds worth of merchandise at any one time. There are over 1000 products available on our website and many of these are available for next day delivery. We also have a huge parts and accessories inventory. We are authorised dealers for Hayter, Atco and Qualcast, and are the UK national distributor for the Friendly Robotics Robomow range of robotic lawnmowers. This could be why so many Local Authorities, schools, colleges and universities choose Mower Magic for their procurement of machinery. At Mower Magic we believe in every one of our products. We have a highly trained team of staff, who have experience and expertise in all aspects of garden machinery. They can give you all the help and advice you need. When new products appear on the market they must first go through our extensive testing programme. We wouldn't sell you anything we wouldn't use ourselves and feel that this enables us to advise you in the best possible way. Mower Magic is the UK's leading retailer of Home Robotics. We have an extensive collection and our own enthusiasm resulted in us appearing on a national television technology programme. Mower Magic Ltd are completely dedicated to your total satisfaction. If you have any suggestions or comments please email us at sales@mowermagic.co.uk. CREDIT CARDS: We accept Visa, Mastercard, Delta, Switch, American Express and Solo cards. CHEQUES. You may also pay by cheque. Cheque should be made out to "Mower Magic Ltd". You should allow 10 working days for cheques to clear, after which the goods will be dispatched (subject to stock availability). You have the right to cancel an order which is not built to special requirements. These rights are under the distance selling regulations 2000. This right ends on the expiry of 7 working days, after the day on which the consumer recieves the goods. Goods must be returned in an unused state, and with their original packaging. The customer should obtain proof of postage or send goods via recorded delivery. The consumer is liable to pay for the cost of returning the goods to ourselves. We will return your money within 30 days of notice of cancellation (ie. 30 days from the date the notice was posted or given). These rights apply to private consumer sales only. All product prices are VAT inclusive. We recommend that goods should be inspected before they are signed for, as goods obviously damaged in transit should be REFUSED. You must notify us as soon as possible, and ideally within 24 hours if at all possible, if your goods are subsequently found to be damaged. In additional to your legal rights relating to faulty or misdescribed goods, all products come with manufacturers warranty of between 1 and 5 years. In the unlikely event that your purchase develops a fault within the warranty period, Mower Magic will refer you to your local dealership where the product will be examined by their qualified technicians and repaired as per the warranty details. Whilst in your care, machines should be serviced and inspected regularly by a qualified mechanic. Except for our negligence or breach of contract, any problems that may occur from incorrect assembly are not warrantable, nor are the suppliers culpable. Please take safety seriously. * FAULT: Please remember to enclose details of the fault - include as much information as possible. * YOUR DETAILS: Include your Name, Address and Telephone details. * PURCHASE: Please specify if your Roomba was purchased from us, including any order number, or if it was imported from abroad. * CLEAN: For Health & Safety reasons you MUST empty the collection bin and make effort to remove as much dust and dirt from the machine as possible. Roomba's sent to us for service INCLUDING WARRANTY CLAIMS that are full of dust and dirt will be subject to a £10 + VAT Cleaning fee. * IDENTIFY: You should attach your Name and Telephone Number via a sticker or tag to ANY and EVERY component sent to us. Mower Magic will not be held responsible for items sent to us that are not clearly labelled. Mower Magic does NOT operate a "Try & Return" policy. Faulty goods should be notified to us as soon as possible. As a rule we do not collect goods from customers unless the fault occurs within the first 30 days, however we can arrange courier collection at your cost. We are under no obligation to accept returns of Non-Faulty goods after the 7 day cooling off period. Spare Parts: Mower Magic will attempt to source spare parts for customers on occasion. We can only do research with the information given by customers and for that reason Mower Magic will not be held liable for any wrongly supplied parts whatsoever. All parts are researched and supplied on a best endeavours basis. Customers should note that we will do our best to supply parts based on information received. Except in instances of our breach of contract, Mower Magic will not be liable for any return postage costs incurred if the parts turn out to be incorrect based on the customers description. These parts are subject the distance selling regulations, as above. Swaps: Customers who order incorrect parts and subsequently send them back asking for them to be "swapped" for a different part will be charged carriage at the appropriate rate for the second delivery. 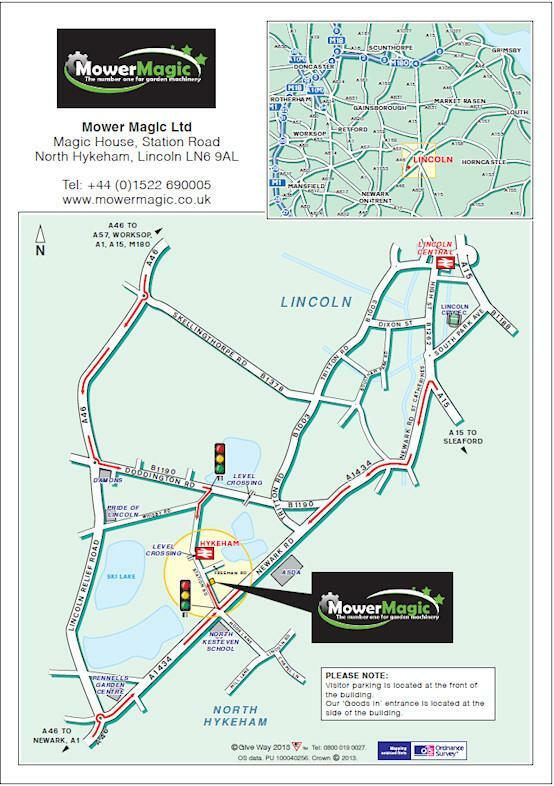 NOTE: If planning a visit to Mower Magic please be aware that we are a primilarly mail order company, and have a relatively small showroom Only a limited product range is on display - most items are dispatched from our satellite warehouses that are not open to the public . Please call ahead to make sure we have the item you need before travelling. How To Identify Your Mower!